Last winter in Minnesota was a huge disappointment with its lack of snow. 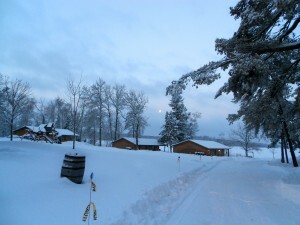 The moon was setting over our cabins as I came back from dropping the girls at the bus stop. My camera didn’t do the beautiful scene justice!! And after a freakish rain ruined our snow earlier this month we thought that this winter might be a repeat of last year. However, we got a lovely storm Monday night which dropped about 4 inches of snow at Wildwood and 8+ just to the north of us. The warm temperatures that accompanied the storm was also a nice surprise. After spending a week or more in the double digits below zero I can tell you that 14 degrees feels like summer!! One of our favorite stops while out snowmobiling area trails is the Scenic Pines restaurant! 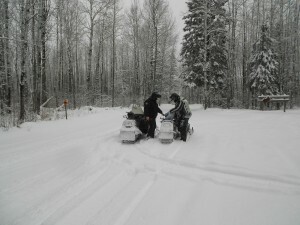 We took advantage of the new snow and went snowmobiling a couple of times this week. Both days we headed northwest out of Marcell on the Marcell Trail to the Cameron Lake Trail to the Herb Brandstrom Trail. Last Saturday when we rode we had the girls with us so we didn’t get quite as far as we would have liked. It was fairly cold so we stopped to snack and warm up at Antler Lake Store (always a great stop for gas, snacks and a bathroom break) and then had lunch at Scenic Pines. The trails were so good that we decided to head back that way on our regular Tuesday trip to see if we could get a few more miles on and try out the Taconite Trail. We made it to Scenic Pines (again!) for lunch and then got just 15 miles or so up the Taconite before we had to turn around and head for home. The trails were ungroomed with 6-8 inches of fresh snow and I’m telling you it was the most fun we’ve had in a long time!! We met snowmobilers who had ridden farther north on the Circle L and Circle T Trails and they thought there was close to 12 inches in far northern Itasca County. We rode the Taconite Trail yesterday and the new snow made for a beautiful ride! 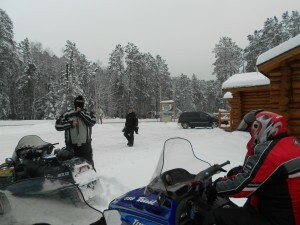 We just love snowmobiling the Taconite Trail and yesterday was a blast. Someday we’re going to ride the Taconite from our place up to Ely! The Marcell Trail is a little rough in spots but very rideable. The Cameron trail was also rough but the farther east we traveled the smoother the ride. The Herb Brandstrom trail was beautiful as was the Taconite. After the clubs get those trails groomed this week the riding is going to be fantastic! The Bushwacker Trail that runs just south of Bass Lake was groomed today and looks good. Maybe we’ll sneak in another ride yet this week just to check in out! Our ice fishermen in last weekend did really well, too. They caught nice sunfish, northern and some bass. They found most of their fish in about 10 feet of water hanging out in the vegetation. Bass Lake is very accessible right now with good ice! 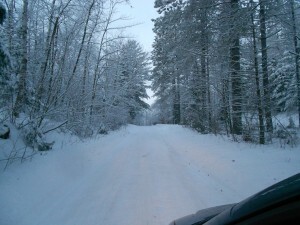 There is plenty of ice for truck traffic but after the snowfall we received Monday access by snowmobile might be easiest. The weather is supposed to turn cold again this week but it is winter after all! At least we won’t be losing any of our new snow to warm temps. We hope you have the chance to get out and enjoy this beautiful Minnesota winter! 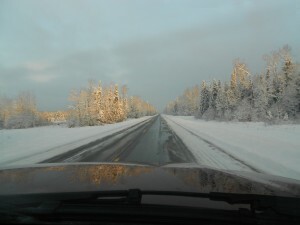 The drive north on Highway 6 yesterday was beautiful with the rising sun shining on a stormy sky and flocked trees. The drive into the resort was beautiful, too!